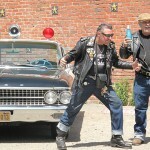 American Graffiti: Where were you in ’62? 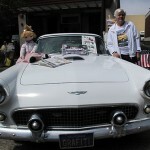 Home/Festivals & Events, Petaluma, Planes, Trains & Automobiles/American Graffiti: Where were you in ’62? Well, I wasn’t born yet. My parents weren’t even dating. But, they were part of the American Graffiti generation, spending their teen years cruising “the boulevard” (albeit entirely different boulevards), executing Chinese fire drills at intersections, and drag racing for pink slips in the outskirts of town (ok, that was just my dad). Today, things have changed: cruising is outlawed in many towns, Chinese fire drills are no longer PC, and yesterday’s outskirts are today’s housing developments. But, the idyllic image of that generation became part of my childhood and holds great nostalgia for me. 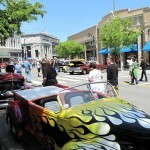 Attending Petaluma’s Salute to American Graffiti isn’t just about seeing old cars and paying homage to a famous movie; it’s about remembering a unique time in American history. 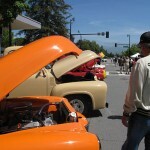 The Salute to American Graffiti weekend is full of energy and enthusiasm. 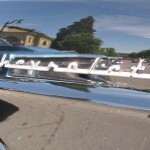 It’s great fun to walk downtown Petaluma and see the streets packed with classic cars, hear Wolfman Jack’s throaty voice bellowing from the radio, and watch people dressed in throwback attire posing for photos in front of the “diner”. 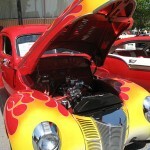 We made it to the east side car show on Friday night and things were already hopping. Many people come from the surrounding area but more than few made tracks to get here. 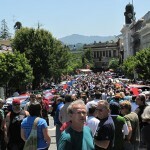 On Saturday more than 400 cars turned up for the event. They were still filing in when we arrived downtown in the morning. My dad came up for the day, sporting his Lafayette Shift Misters jack from his high school car club days. He can talk cars like only a guy who really knows that generation of cars can talk cars. And, there are plenty of people to talk cars with at the Salute. I can only understand a fraction of the “car speak” but I know that cars will never again be what they were in those days – more than just modes of transportation, more than just status symbols, more than just the sum of their parts. Cars in those days represented a way of life. Today they are icons of an era. On the American Graffiti weekend there is no shortage of movie buffs staking out the old filming locations and getting celebrity autographs. 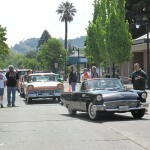 When we moved to Petaluma we didn’t know it had been a filming location for American Graffiti. Since then we have watched the movie again and again, picking out familiar spots; the old banks are the most conspicuous. You can download a filming location map from www.americangraffiti.net if you’re interested in what happened where. And, even if you’re not an American Graffiti fan it is hard not to be entertained by what Petaluma looked like 37 years ago. When American Graffiti came out in 1973 I was only about four years old and it was many years before I was “grown up” enough to watch the movie but I was raised on the TV spin-offs of Happy Days and Lavern and Shirley. As kids we dressed up in “fifties” outfits and listened to the music. Now, for one day a year, I can live the nostalgia just a little bit.